Small amounts of hessian backcloth and good quality felt . 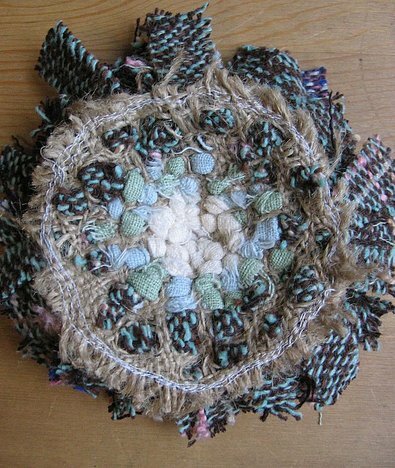 a rag-rug hook or small pliers (or probably even eyebrow tweezers will do the job). 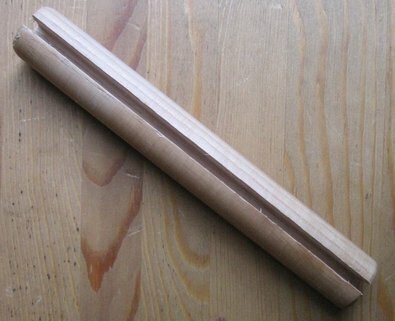 a piece of 1" wood dowel with a bit gouged out, if you know any wood-cutterly types, it should be easy enough to make one. You just wrap your strips of fabric around it and snip snip snip through the channel. Either that or just roughly guess the length, it doesn't really matter. 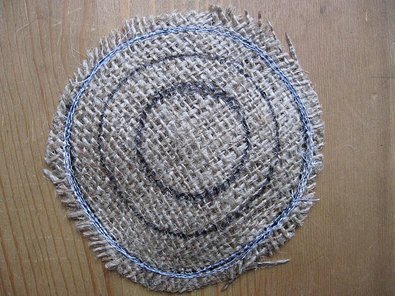 Draw a circle onto your hessian, bearing in mind that these flowers get big - my outside circle has a diameter of 2.5" and I've ended up with a flower almost twice that size (the one I made last week turned out enormous and very heavy, more suitable as a paperweight in fact). then, mark smaller circles as a guide if you want to use more than one colour. 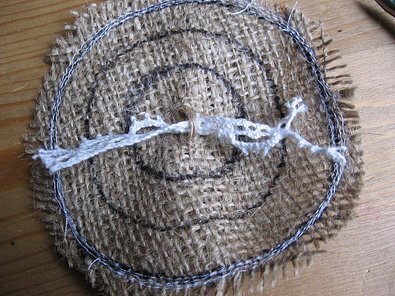 Before cutting out, stitch around your outside circle 4 or 5 times- this is very important, otherwise it will fray like buggery, and then cut a good half an inch away from your stitch line .I cut it far too close to the stitch line on this one, but just about got away with it. This method is explained far better here , under the rag rugger link on the left, (this is also where I got all of my equipment from). 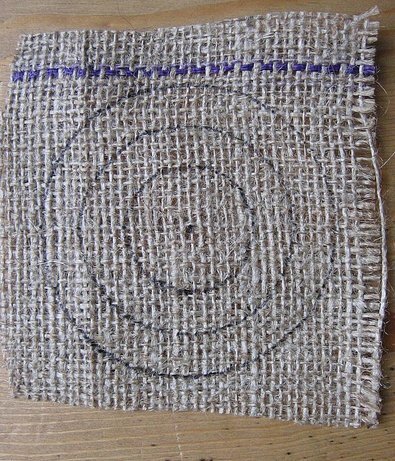 Leave just a couple of hessian strands between each strip and work in circles out towards the stitched edge. 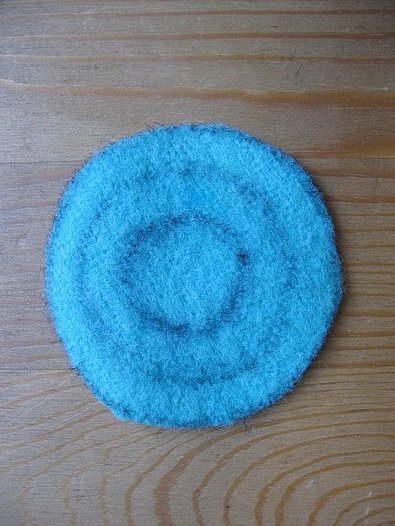 Cut a circle of felt to the same size as your hessian circle and stitch together. Apply your brooch back and there you go... easy. then, giving your fabric strips a little twist in the middle, stitch onto your felt pieces, again keeping the strips nice and close together. Work from the centre, outwards. 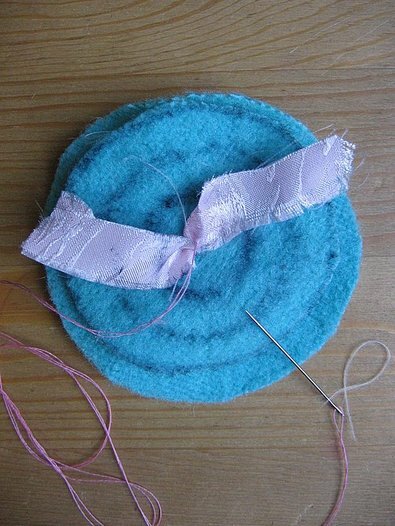 Trim the larger felt circle to the same size as the smaller one and blanket stitch together to give a nice neat edge. Attach your pin/brooch back as before. This second method is just as easy and quick as the first, and both are fun to do . The hook technique is particularly fun for children to do as there are no stabby sharp needles involved. 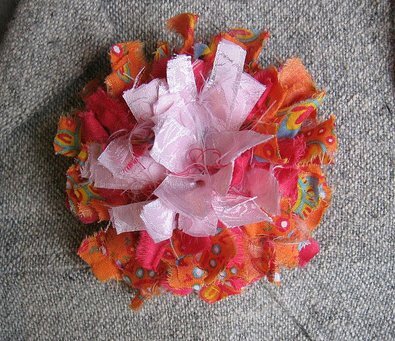 Molly has made quite a few of these now, she loves to choose the fabrics, in fact she choose the colours for the second flower. Light pink, dark pink, orange. YUM. Do let me know if none of this makes sense, I don't mind, I'm used to people telling me I don't make sense. I'm off to the shops now, wearing my new corsage to brighten up a very grey English day. this is completely.. understandable..enviable.. and motivating.. I want to do them right now.. wonderful you.. thanks.. enjoy your corsage.. I really like the way those look. Very fun. Thanks for the no-hook option as well. Beautiful! Your instructions are completely clear. I don't know the term 'hessian backcloth' but it looks like burlap to me, for those of us stateside. 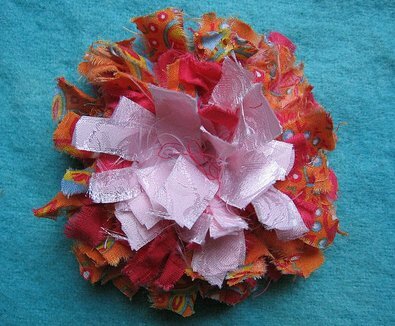 What a terrific way to use up scraps of fabric! Definitely on the to-do list. These flowers are really cute. Nice tutorial too. And your studio looks so nicely organized and colorful. I am on holiday in the uk and i can definetely agree that the weather needs some brightening up! OH...this is so cute!! I want to make one right away!! Were can I find that hessian? thanks for such great instructions. i always wondered how those were made, and now i know, and can make them, too! great tutorial, you should post this to the whiplash site for accessories, i think you have another day, or a couple of hours.... at any rate - thanks! Really great tutorial! Love the flowers. 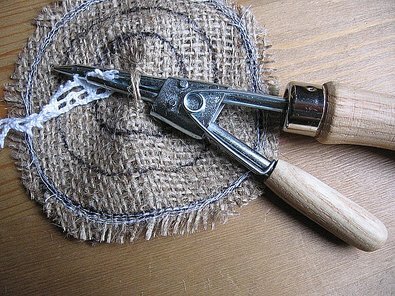 Could you use a crochet hook as well? I am seriously going to try this! Great tutorial, Lyn! Thanks for sharing. Thanks for the tutorial! They're so beautiful! thanks! the 2 options of making it was thoughtful and much appreciated. 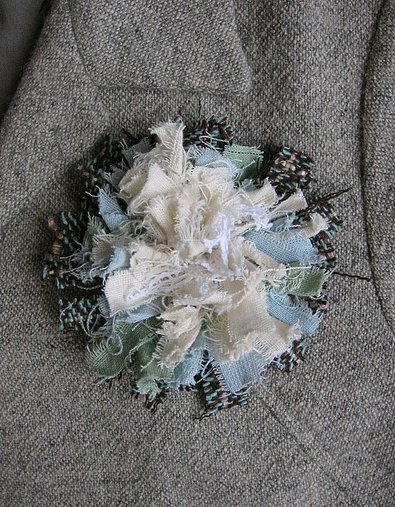 I was just thinking about a brooch to make for this weekend. Oh, I LOVE everything that comes after the "OR..."! Nice and easy. That tool in the section before reminded me I have to go to the dentist... Thanks for the tutorial and the great photos. OOoo so simple and pretty. I could use one to brighten up this soggy Portland morning! That is pure genius! Very easy to understand too. I think this would be fun for my kids to do for teacher gifts. Really love it! Love the dowel tool too. What a great idea, I bet older kids could do this too! I bet it looks great on that English tweed blazer! wow! I think these are great and I WILL be making at least one. I love corsarges, I make so many of them, a bit of a trade mark for me (well, friends laugh at them!!!) mostly knitting but I made a great fabric one yesterday to go on a bag. SO thank you for sharing and I shall have a go. i musttry this NOW! you are ever so creative...my envy is yours! i have tons of baby fabric left...maybe a corsage to go on the side of a diaper bag...maybe. thanks for all the great tips! What a neat idea! They look terrific. Thank you so much for taking the time to do this a second time around! I love it. Oh you are *so* good. I have envy... where can I dig out some hessian & a rug hook? My mum's old house had a hessian wall on the upstairs landing, but I'm not sure I've laid hands on any since! Time to rummage in the Huddersfield craft shops. Thank you for this tutorial! Both flowers are beautiful. I am sure you brighten up the day! THis is so fabulous! Thanks for the awesome tutorial! SO much inspiration- so little time! I think I really need to make one of these. Either method makes a gorgeous flower! Fabulous tutorial - thanks for doing it! Oh, thanks for your teaching!! You are so talented!! I discover your blog a few days ago and i love it!! And these flowers are totally beautiful!! I want to try for my scrapbooking! thanks a lot to share!! Wow, brilliant, love it. Thanks so much for this. Thank you so much for showing us how we can make such beautiful flowers!!!!! I probably made the search harder than it needs to be, but I couldn't find the raggy making stuff here in the U.S. online, so I just bought a kit from a U.K. seller! It's going to be a Christmas gift for my daughter. Love the tutorial. Thanks for the tutorial. I just finished one! Thank you so much! Your flowers are beautiful and the instructions much appreciated. Thank you, the flowers are very pretty. I like the colours and the tutorial is great. 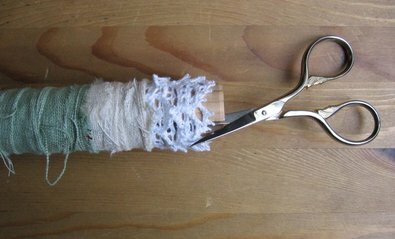 I am sure it would also work with some linen (one can always pull out some threads) and a crochet hook. Will definitely make one. Bettsi, that's a great idea to give them as teacher gifts!! ohhhh thanks so much!! your tutorial it's great! your flower ara so yummy! Will you just stop being so talented please? You are giving your sister a BIG inferiority complex. Really, I have no artistically talented bits in me. Looks like you got the entire share. One of the comments above said something about your tidy studio. Ha ha ha ha!!!! You have to see it - it is amazing, but not in a tidy way - but a good way nontheless. Jeez - what a fantastic idea. I'm rag rugging at school and it NEVER even occurred to me to make corsages! Maybe I'll get the kids to have a go. Thanks a lot for the tut though. By the way it's Divali today and I'm wishing everyone a Happy Divali. 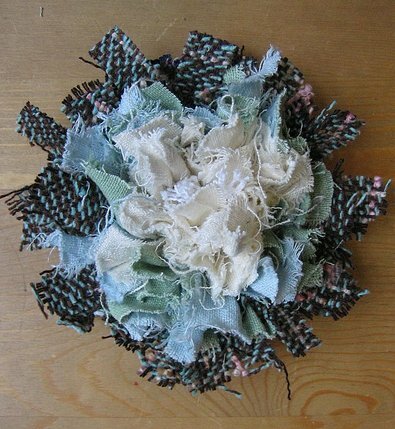 Have you got a flickr group so people can post their own pics of corsages they've made? You deffo should! I'll be blogging my corsage later. Spent the afternoon on the couch making it! Thank you, thank you, for this. I didn't actually imagine they were made like that. I have a bag that definitely needs one of these. fabulous! another christmas gift idea - thank you for this generous tutorial! quick simple and easy to understand. Thanks for the tutorial! I must add this to my "Urgent to Make" list! merci, j'y suis arrivée, veux tu voir le résultat? Loved the raggy flower... what fun. Made my first one today and know there will be lots more. Thank you! My God! Their great. I love them. Your very good.Can I try?! I'm just visiting you blog for the first time! So creative,thanks for sharing this. i like the lay out of your blog,keep up the good work. This is great,i like the layout of your blog keep up the good work. I am frensch so excuse me for my english ! Your blog is plenty of lot af beautiful créations. SEE YOU SOON ON "bricole et casserole"
There are many interesting information's about Raggy flower tutorial, I was searching like this site since 2 month's.Today I am very happy.I am feeling very fresh after visit this site.